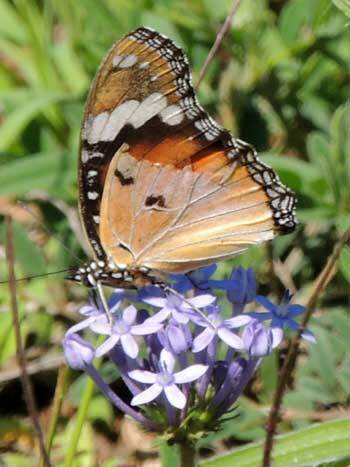 Observed at Mombasa, Kenya, January 2012. There is irridescent blue surrounding the white spots that becomes more or less brilliant depending on the direction of light. 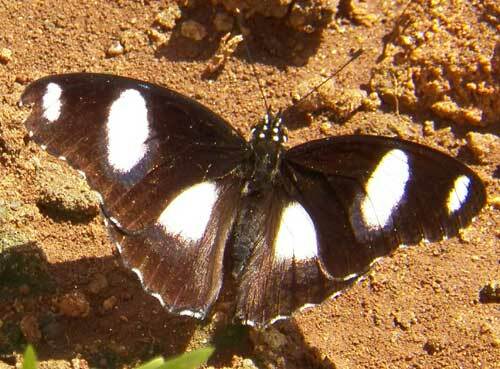 Other common names applied to this widespread butterfly species are Danaid Eggfly and Diadem. All the names reflect the fact that these butterflies are polymorphic and that color forms taken by the females makes them appear to be one of the toxic milkweed butterflies. In other words the female may look similar or completely different than the male pictured at left! Observed near Mweiga, Nyeri County, Kenya, Dec 2012. 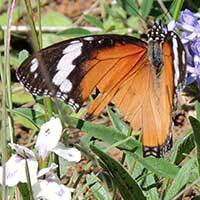 This is a female and mimic of the African Monarch butterfly.